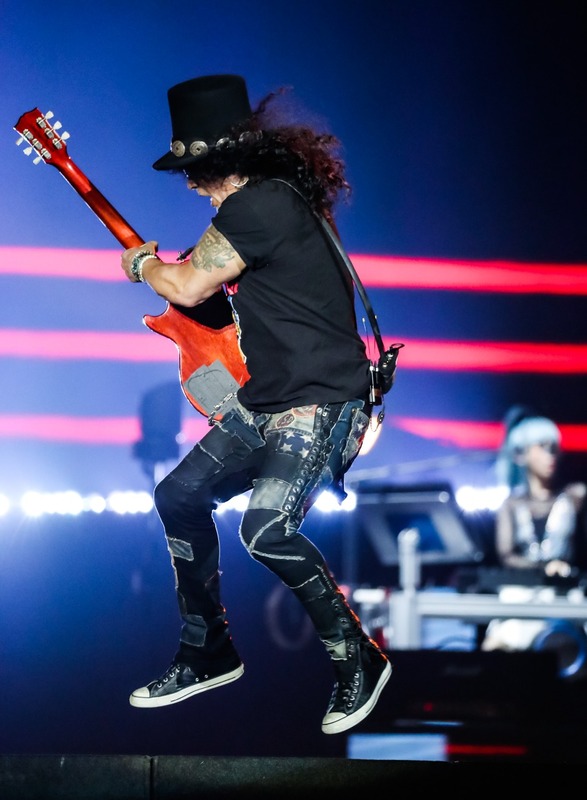 Abu Dhabi, UAE – November 2018: Legendary Californian rock band, Guns N’ Roses brought a full house of music fans to their knees during a mesmerising two hour set as they closed the 10th edition of the Yasalam After-Race Concerts at du Arena tonight, concluding four days of action-packed live music and entertainment across the Capital. Delivering November Rain in more ways than one, the renowned rockers opened their debut Abu Dhabi concert with the trademark gritty attitude and electrifying stage presence that is synonymous with their reputation and has cemented Guns N’ Roses’ position as one of the best rock bands of all time. 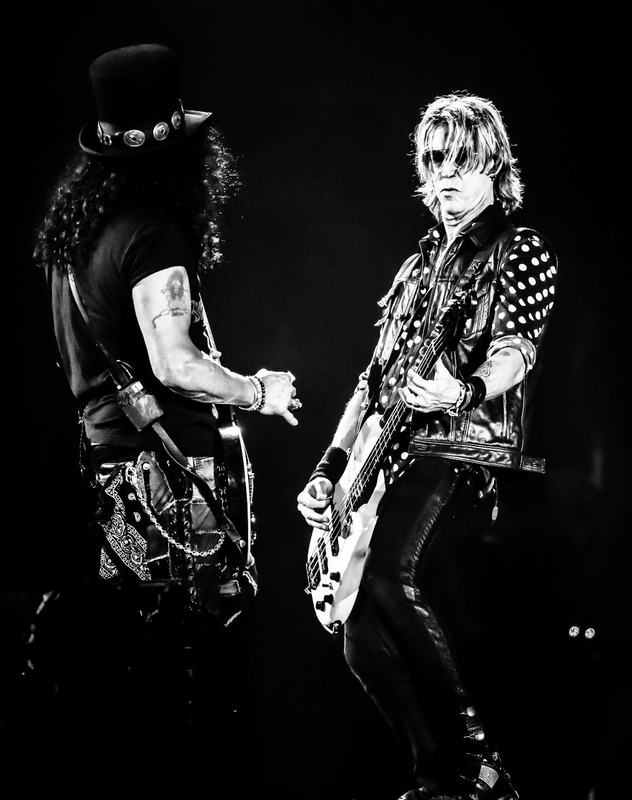 Commanding the crowd’s attention, at maximum capacity for du Arena, from the moment Slash struck the first chord, the enigmatic rockers made their introduction to Abu Dhabi in a powerful way, drawing choruses of cheers from the crowd which echoed to every corner of du Arena. Starting off their set with ‘It’s So Easy’, released as the band’s very first single in 1987, and included on their debut album, ‘Appetite for Destruction’, they followed on with ‘Mr Brownstone’ from the same album release before moving on to ‘Chinese Democracy’, their sixth and most recent album, titled the same. It was the next hit that some might describe as the most electrifying of the evening, as the band delivered a powerful rendition of ‘Welcome to the Jungle’, which peaked at number #7 on the Billboard hits in 1988, one year after its release, and remains one of the most well-loved rock tracks of all time, a sentiment that was reinforced by the reaction it drew from the joyous fans at du Arena tonight. Following that, Bassist Duff McKagen took the mic, delivering a fiery rendition of ‘Double Talking Jive’ before Axl reclaimed the vocal lead, supported by an epic minute-long solo guitar riff by Slash, who’s incomparable talent has rightfully solidified his position as one of the most gifted guitarists in history. The three-time Grammy nominated rockers continued to own the stage, making their way through a collection of their hits, including ‘Rocket Queen’, ‘You Could Be Mine’, ‘Civil War’ and ‘Coma’, before Slash owned the stage once with another prodigious guitar solo of ‘Godfather’. One of the band’s most famed hits and number #1 Billboard hit, ‘Sweet Child O’ Mine’ followed, yet another unmissable moment to add to the collection of incredible moments the Capital has witnessed over the past four action-packed nights. Made up of front man Axl Rose, guitarist Slash, bassist Duff McKagen, keyboardists Dizzy Reed and Melissa Reese, and drummer Frank Ferrer, the magnetic performance from Guns N’ Roses caused an ongoing collective of cheers from concert goers at du Arena as they continued to make their way through their catalogue of rock classics, including ‘Better’, ‘Estranged’, and 1991 ‘Use Your Illusion’ cult classic, ‘Live and Let Die’. It was fan favorite ‘November Rain’ which sent the crowd swaying, a slow song by band’s standards, which when followed by ‘Blue Hole Sun’ signified the end of the electrifying performance. Opening the stage for Guns N’ Roses was Lebanese rock band, Wanton Bishops, who successfully fired up the crowd ready for a compelling performance to follow. Made up of Nader Mansour and Eddy Ghossein, the Beiruti duo and ‘Hitman’ performers set the tone of the evening, warming up the masses with their individual take on classic rock ahead of Guns N’ Roses’ performance. Drawing to a close on Sunday evening after four action-packed nights of incredible performances, the Yasalam 2018 After-Race Concerts welcomed a diverse range of genres from the lineup of international hitmakers, including; American rapper, songwriter and record producer, Post Malone, Canadian rapper and ‘Starboy’ performer, The Weeknd, UK crooner and Stay with Me singer, Sam Smith, and of course, legendary rockers, Guns N’ Roses. The combination of the four unmissable acts, paired with the high octane on-track action, made for yet another unforgettable year for the Formula 1 Etihad Airways Abu Dhabi Grand Prix, marking the occasion of the 10th anniversary in unmissable form. Stay on the pulse of this concert season with FLASH Entertainment’s ThinkFlash App. Providing fans easy access to information about all FLASH events and exclusive content right at their fingertips. The app is available on iOS and Android. Visit www.yasalam.ae for further information.